We are very excited to be publishing this as we launch our new website which will be hosting monthly blogs, along with a busy news section, to keep you up to date with all that is happening across our three nurseries. We look forward to welcoming guest bloggers along the way who will be sharing their insights on childcare and our community so please do get in touch if you’d like to contribute. Some of the areas we will be covering in the months to come are healthy eating, outdoor play, preparing for school and lots more. We will also be introducing you to members of our fantastic staff in our ‘meet the team’ blogs and, to add a little extra interest, we have some of our children lined up to handle these interviews so we look forward to some tough questions for our Managers! If you don’t already follow us on Facebook and/or Twitter, please do. Here we share regular updates and photographs with news of what all of our children have been up to at nursery. To celebrate the launch of our new website, we will also be running a competition later this month. Watch this space! We employ around 60 individual members of staff at First Steps, from Nursery Managers and our brilliant childcare teams to our hardworking Admin Assistants and dedicated Cook. We are extremely proud of our fantastic team and everything they do to make our nurseries such wonderful places for the children to be. To celebrate this and provide a little insight into members of our team across our nurseries, we will be selecting a few to take part in our series of ‘meet the team’ interviews. To make things a little more fun, we’ll also be asking the children to come up with questions of their own (let’s see if you can spot them!) and draw a picture of the individual too. So … if there is anyone you are particularly keen on getting to know better, let us know! It’s with great excitement, and a little bit of sadness, that we prepare to say goodbye to our children who will be leaving us this summer to start school in September. Many of them have been with us since they were tiny and some of us can remember saying goodbye to their big brothers and sisters before them. It’s a big step but one we know all of our school leavers are ready for. We’ve watched them grow and develop so much over the past year and they have all embraced the many activities we’ve been enjoying in preparing them for this next milestone. 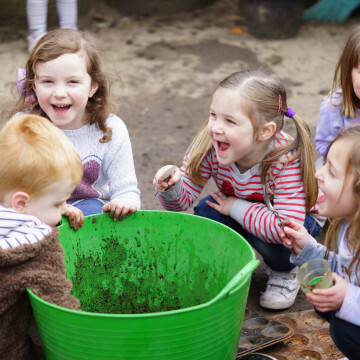 We believe that our nurseries provide an excellent start for the children; encouraging independence, developing social skills, understanding the daily routine and learning key skills such as dressing and feeding themselves. All of this will prove an enormous help when they walk into big school on their first day. And don’t worry if they don’t know many other children, they soon will. Reception class is a fun, busy, exciting place to be and we will all look back in another year’s time and not believe how far they have come. Good luck to each and everyone of you and please stay in touch. We love nothing more than hearing how the children are doing. We will miss you all very much!